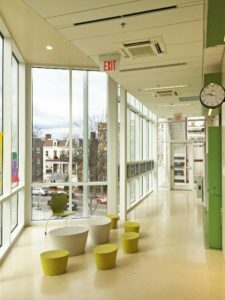 Several years ago, Washington D.C. Public Schools (DCPS) participated in a multiyear study, the DCPS Modernization Program, in an effort to enhance performance and optimize energy efficiency across the district’s buildings. 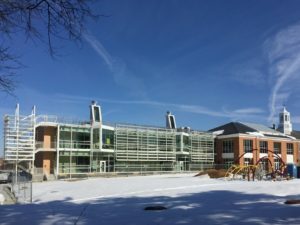 Results from the program laid the groundwork for a unique competition, which uses building science to teach students, administrators, and facility managers how to improve energy efficiency. 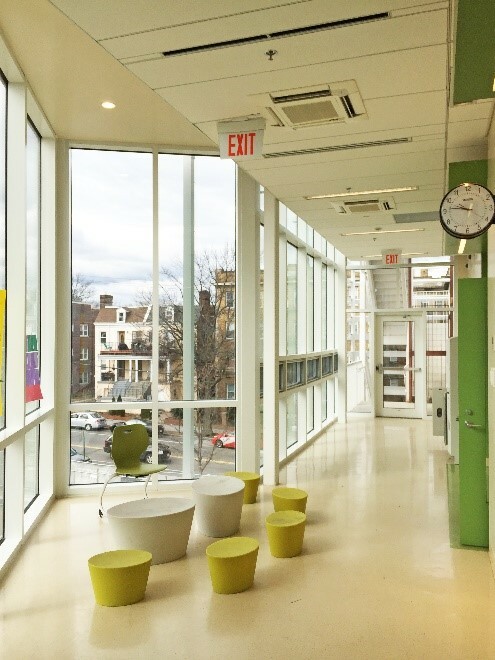 The DCPS Modernization Program established a set of benchmarks from retrofitting and building measurements that were used to identify strategies DCPS could employ to improve energy efficiency across the district. Passive design features, like additional insulation, light shelves, shade walls, and innovative heating/cooling design, were among the options considered. These features reduce the amount of energy that an HVAC system needs to adequately heat or cool a space. Less demanding HVAC systems have lowered upfront installation costs and are cheaper to operate. Money saved can be put toward adding even more energy saving features to DCPS buildings. DCPS’ Sprint to Savings program, which is based on the efficiency measures built into the modernization program, is a data-driven, electricity reduction competition created by the Department of General Services to promote energy conservation at DCPS. 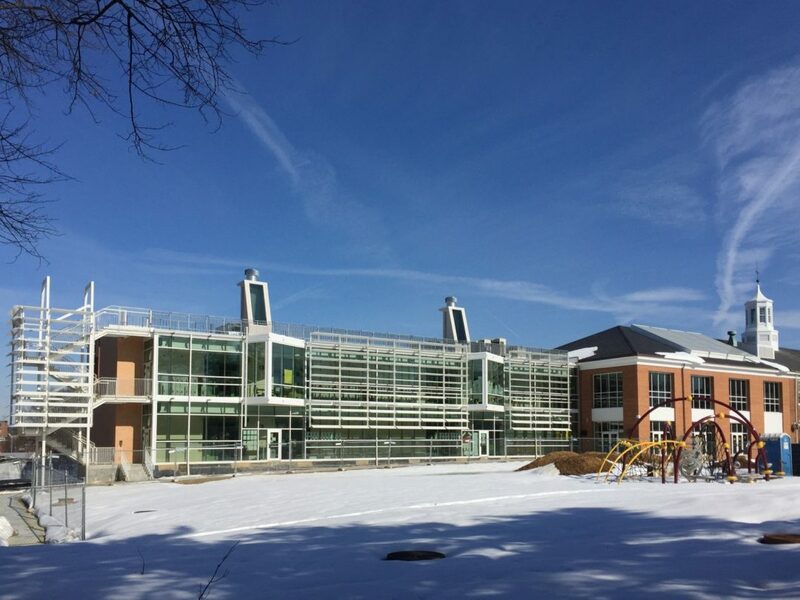 A unique aspect of the competition is its use of the school building as a hands-on learning tool, adding significant educational value in addition to cost and energy savings. The first Sprint to Savings competition was held in February 2014 and the second was held from December 2014 through January 2015. The competition challenged participating DCPS schools to reduce their electricity during a five-week period and their performance was compared to a weather normalized baseline period. Over the course of both competitions, hundreds of students were directly engaged in energy education activities, thousands of dollars were saved, and many additional saving strategies were identified. Data from the second competition was used to compare average daily kilowatt hour (kWh) consumption during winter break compared to daily consumption during the first three weeks of December. As a whole, the 25 schools that participated in the competition reduced kWh consumption during winter break by about 17 percent compared to the preceding three weeks. A further analysis of five schools revealed that they were successful in turning things off during unoccupied periods during the competition. 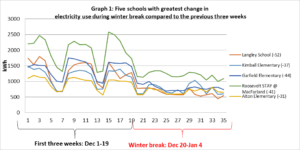 As the graph below shows, these schools experienced significant reductions on each weekend during the competition and for winter break. The well-defined peaks between days 1-5, 8-12, and 15-19 represent occupied weekdays when consumption would be at its highest. The troughs—day 6-7, 13-14—represent the weekends. The curves flatten out at day 20 with the beginning of winter break and remain low. These curves are exactly what we like to see. In contrast with the top five schools, the five schools at the bottom were less successful in shutting down over winter break. Looking at the load profiles of these schools and analyzing the data, these buildings are consuming electricity at nearly the same rate during weekends and holidays as they are when the building is fully occupied during the week. This is particularly true for Cleveland Elementary and Bruce Monroe @ Parkview, indicated by electricity use curves that are essentially flat with no troughs or peaks. Key takeaways include a) improve shut down performance during unoccupied times to see energy reductions, and b) implement tighter HVAC scheduling on a permanent basis. If the bottom five schools realized electricity reductions over winter break consistent with the competition average of 17 percent, the five schools would have reduced their spending by $8,012, or $5,718 above their actual spending. While Sprint to Savings raises energy awareness, changing behaviors and realizing sustainable energy savings requires a permanent occupant engagement program. Making permanent scheduling changes at these five school sites presents a significant savings opportunity. A 20 percent reduction would save the city $210,000 per year—or $1 million over five years– in electricity costs. A 10 percent reduction would achieve a savings of $118,965 per year—or nearly $600,000 over five years—across these five facilities. 54 DCPS schools participated (31 of which achieved a 5% or greater electricity savings). 100+ students joined green teams and 1,000s were exposed to energy conservation. 126,000 kilowatts of electricity were saved. $15,120 were saved in electricity spending during the competition. 191,520 pounds of carbon emissions were avoided, equivalent to removing 87 vehicles from the road. 100 mentors from 29 organizations worked with students and teachers during the competition. 6 government agencies and private organizations partnered on the program. The competition has also received national recognition from the U.S. Green Building Council’s Center for Green Schools, and has been replicated in other cities around the country, such as Boston. 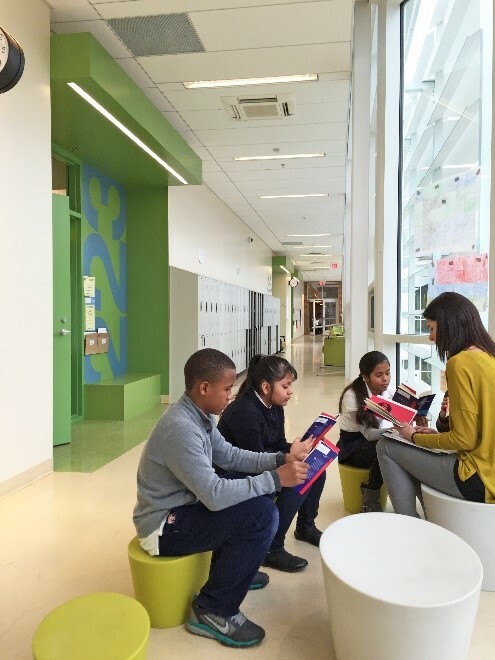 Sprint to Savings ties into DCPS’ existing energy curriculum, presenting an opportunity to use the school building as a tool to demonstrate real-world applications. Designing schools with passive features allows teachers to frame curriculum around the features of the building and their applications. Consider Powell Elementary School, which is pictured below. A sunscreen was installed to help control how much sun enters the space, as well as the temperature inside the building. This particular feature adds 10% in energy savings to the building while an east/west building orientation saves an additional 5%. The school’s solar chimneys reduce energy consumption in excess of 10% depending on weather conditions, and provide cool, fresh air without the use of non-renewable energy. Low-flow plumbing fixtures decrease water usage by 50%, saving $3,007 ($5.60/1,000 gal). At Powell, teachers use the building features highlighted above to teach lessons in mathematics, science, engineering, art, and writing. For example, using math and cost savings from passive building features enables teachers to explore tangents into economics and financial literacy. The curriculum linkages not only engage students, but encourage them to step up and take an active role in their school, community, and at home. 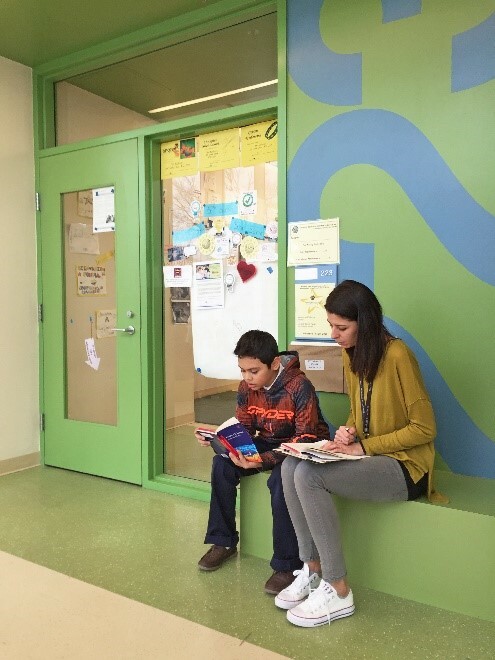 Powell’s use of space and its learning environments allow for differential learning, experiential learning, student-led inquiry connected to the outdoors, and a long life-loose fit flexibility to accommodate changes in classroom size/structure. 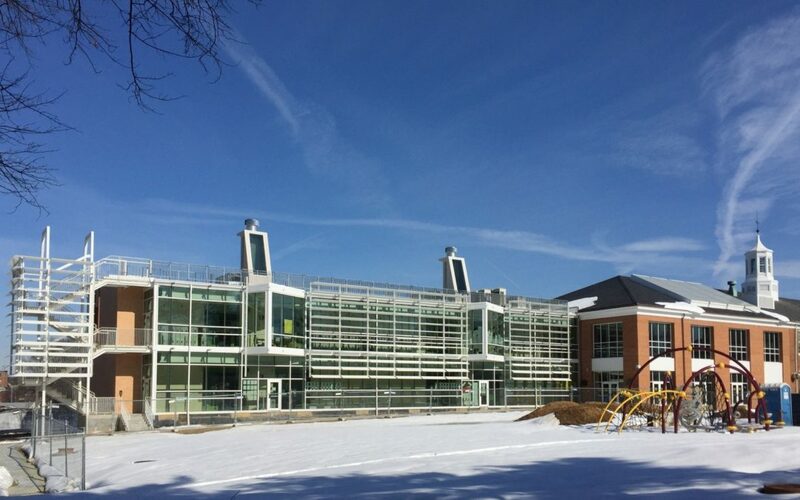 This building has flexible classrooms (large group), bay windows (small group), portals (one on one), an atrium (other large group, experiments) and garden/green roof (outdoor) spaces. Faculty at Powell schedule slots of time in these spaces. On any given day you can find a teaching assistant in a bay with 3 or 4 students. Powell’s planning process has been augmented such that passive design features are now discussed at the outset. The short term cost of implementing these features is justified by the long term savings they yield. The sustainability, via passive design, approach has been quantified and it demonstrates drastically decreasing operating costs. It translates into STEAM curriculum and provides real world opportunities to connect students to the school building itself, as well as their home environments. Students can take the skills they learn at school and do the same assessments at home.